Sweta K Bhanushali Visually breathtaking, Baltasar Kormákur's 'Everest' The Movie is based on the 1996 tragic expedition to the highest peak in the world which saw the death of 12 people in a single season, making this one of the deadliest year on Everest. The film beautifully showcases the splendour and challenges of reaching the summit. It also does justice to the evident commercialisation seen sprouting at the Everest Base Camp as several scenes show a string of people attempting the summit. Image source With chunks of the film shot in the Nepal Himalayas and the Otztal Alps in Italy, scenes from Hillary Step, Camp 4, Khumbu Icefall and the summit were recreated at Pinewood Studios in England. However, the locations look real enough to keep you hooked to the movie unless you make a serious effort to figure out the green background. Image Source: Behrampurcity.com The film stars some excellent actors like Jason Clarke as the Australian Rob Hall and Jake Gyllenhall who plays the competitor, Scott Fischer. Emily Watson plays the base camp coordinator Helen Wilton while Keira Knightly and Robin Wright bring emotion to the story through Jan Arnold and Peach Weathers, respectively, as the anxious, waiting wives. Even as most of the above mentioned characters are given enough screen time, the other climbers are almost ignored except for a few tiny parts of the movie. There are a few doubts on the authenticity of the behaviour of the characters. In an interview, Beck Weathers describes Rob Hall as a very humorous man. “He would have an absolutely plastic face, and he could tell jokes. And he laughed harder than anybody; not because the way he told a joke, he just loved a story, the camaraderie of it.” But in the movie, Hall is shown as a serious man, who gave the utmost important to organising to the minute details. Image source Similarly, Doug Hansen (played by John Hawkes), was a rather fit and tall person. In the same interview, Weathers says Hansen looked like one of the favoured ones who would almost definitely make it to the top. But the character of Doug Hansen throws a very different picture in the little screen time that he gets. The initial look of him will make you wonder if he can make it in the initial portions, leave alone the top! The film is an attempt to showcase the 1996 tragedy in its truest sense but fails to do so. The story keeps jumping from one character to another. When you rub your hand in anticipation expecting a character to break down or an ego tussle to surface, the story jumps to another character. It fails to stick to one single core idea which makes it difficult to identify with any of the characters. The movie catches pace in the second half with the blizzard and storm scenes shot with terrifying élan. It captures the tragedy yet leaves you wanting for more. 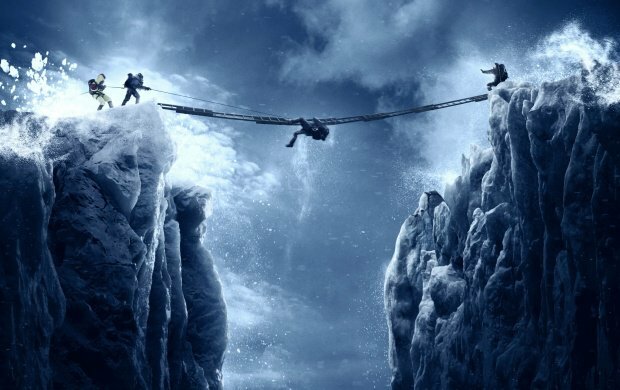 The spectacular cinematography by Salvatore Totino gives a hauntingly excellent view of the expedition; the 1000-foot-drop bottomless crevasse, the characters perilously walking on the ladder-made bridges, hanging on the edge of the cliffs making us clutch our armrests. It has got one thing right though. A good balance of regular cuts from the expedition to the Base camp to the families of the climbers reminds of the number of lives that were affected by this tragedy. One question that lingered on our minds after the movie was ‘Why summit Everest after putting your own life into jeopardy’. But the answer perhaps lies in what George Mallory had said, ‘Because it’s there’. All said and done, the movie is a definite watch, primarily for the cinematography and for the sheer might of the Mt Everest itself.